The Willers family and carpentry business has been in Harston for many generations. Brian’s great great grandfather was George Willers (1815-1890) – a shepherd and publican of the Fleece public house. This had a large room where all festivities such as feasts and weddings were held as there was no village hall then. He had 13 surviving children, 7 of them boys. One of them Frederick Willers (1848-1930) in 1870 started the wheelwrights/carpenters business in Willers Yard in Harston adjoining Walnut cottage, 102 High Street, after doing his apprenticeship in Newton . Frederick’s son George Thomas (1880-1970) worked with him, as did his grandson Frederick George (FG) (1914-87). George T carried on the business in Harston during World War II when his son Frederick G was sent to work at Marshalls on aircraft as he was a carpenter/joiner. FG was given a house in Cambridge with all the amenities. 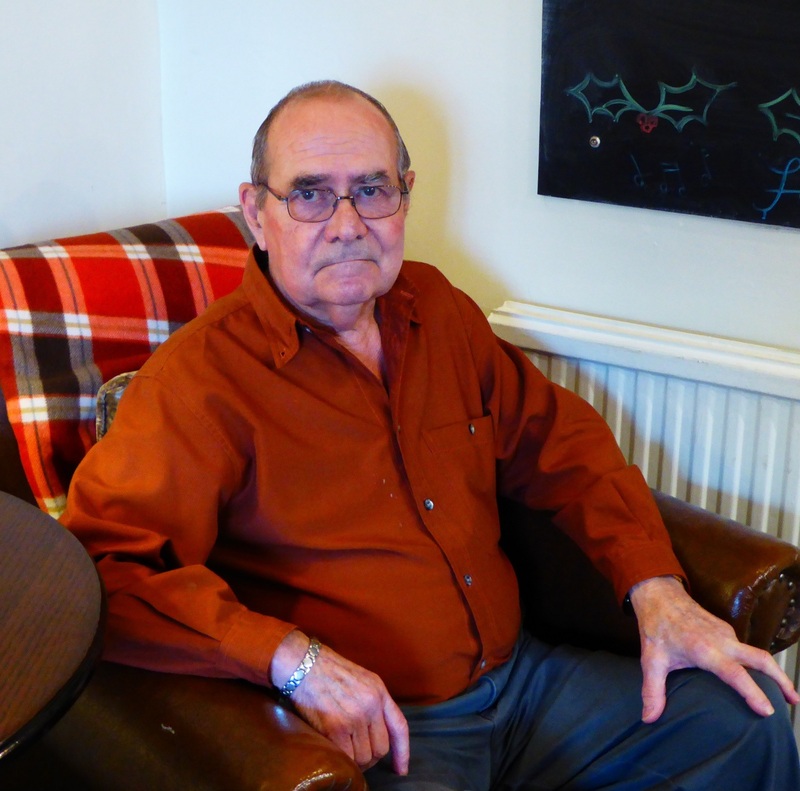 Brian was born in 1942 at the Brunswick nursing home along with his twin brother but after the War the family moved back to Harston to Oak Tree Cottage, near and on the same side as Park house. This house didn’t have any amenities, just one tap. As Brian and his younger brother Peter got TB (and were ill for over a year) they were advised to move out for better conditions and moved to River View – a house they built on Haslingfield Road, just before the bridge. Willers Yard remained in the High Street until the late 1940s but was definitely at River View by 1954. Brian bought land in Button End around 1962 and built Linden Lea when first married, although he moved to Newton in September 1980. Brian can remember the harsh winter of 1962/3 when it was difficult to start their work vehicles and he had to use his car which was parked in a garage at Linden Lea. The meadow between River View and the river was called Blood Meadow – owned since the early 1950’s. Behind the house and in the meadow were a series of sheds that made up the yard. When River View was sold it was bought by Fred Haslop, and he used the sheds to store scaffolding. He later sold the house and the sheds behind were knocked down. However, the Willers still own Blood Meadow and some sheds remain in it beneath brambles. The yard was moved to Button End in 1970, a hundred years after the business was started so they called the new works – Centenary Works. At Centenary Works are various branches of the works – a timber built showroom, offices in a brick building and the workshop in a large, long building. The showroom was where Brian’s Uncle Ernie displayed cabinets and other things he made as a joiner. Behind the showroom was the chapel of Rest – now covered in brambles – as Willers carpenters from early on used to be coffin makers. Brian’s son Matthew now runs Centenary Works while his son Charles does carpentry work for the University. Other businesses have operated alongside Centenary Works – Jo Kierns running Made to Measure and Eversdon Joinery. There also used to be a timber yard in partnership with the Willers run by Peter Janaway. Brian built the Harston Village sign in 1979. The base of the sign is a mill-stone he got from Park House which he had to move to the green where the sign is located. 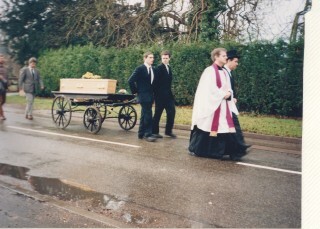 The Willers were the village coffin makers and would walk with the coffin on a hand-drawn bier at the funerals, used as late as 1996. George Thomas Willers did the very first burial at the Parish Cemetery in Button End. Brian remembers The Rev Mansfield Williams with affection as he often took him to the Queen’s Head, run by Gladys, for an underage drink after he had been helping around the church or after a funeral. Willers would have made the coffin. One day the Reverend sat on a bier outside the Coach and Horses asking for money and said ’if the parishioners won’t come to me, I’ll go to them’! (Bert Morrison used to run the C&H, which had a petrol pump outside). The Reverend liked Harston so much he asked to be buried here even though he no longer lived here. Brian’s great great grandfather was buried just inside the parish churchyard on the left-hand side. During the war, German prisoners of war worked at the Willers Yard and several stayed at Oaktree Cottage. One worker they knew, called Fritz, a Czech, worked for the Seagraves and eventually married the Seagraves daughter so stayed here. Between Hauxton and Trumpington was called the High Mile and on the Trumpington side was the POW camp. Brian remembers his family coped well during rationing time as his parents kept pigs, chickens and geese. They would register 11 pigs with the government but have 12. The local butcher would kill and smoke the twelfth pig and take half for himself. The rest was hung in the Willers’ pantry and Brian can remember the smoke smell. Brian’s mother’s father was a farmer and wheeler-dealer in Norfolk. They would get a stone of sugar from him at a time but have to hide it on the way home; they were once stopped and searched but they didn’t move the children off their seats and they were sitting on it! They also hired a field from Hurrell’s to keep their house cow. Brian was expected to milk this morning and night, but it gave plentiful milk from which they made their own butter and cheese. Once when ‘fowl pest’ hit that area of the village chickens and geese had to be slaughtered but Brian’s parents managed to hide a chicken and a goose which were unaffected and not killed. Brian went to school at Harston until he was 15, then went straight to work for his dad as a carpenter while his twin brother Keith became a bricklayer. After school Brian and his brothers used to go round to the Lawrance smithy on the High St near the school and pump the bellows to create the sparks. Brian says he seemed to get the cane daily for one reason or another. If you had green stains on your hands the Head, George Royston, would cane your fingers with a dowel rod or your backside as you left the room! The stain on hands was from peeling walnuts which Brian regularly had as they lived in Walnut cottage with their own tree. George Royston thought the boys were stealing from his walnut tree. When Royston’s wife used to bring him cake he would often fall asleep and the schoolboys would eat his cake and he didn’t seem to realise. One time Brian got into trouble for climbing up the bell tower with a group of girls and getting locked in by David Deacon. After George Royston, Peter Shoot took over and Brian only got the cane twice in the last 4 years! Pupils may have stayed even longer at school if they missed out schooling, like Neil Chapman whose father Cornelius was a traveller so he was two years older than Brian when he left. When Brian and his brothers were young they would go to Ms Collin’s stables (where the Limes now is) and they all learnt to ride – some of the horses were very large. The Willers had their own horse and a donkey for quite a while, until about 1962, and even an ex-racehorse at one time. At one time Brian’s dad used to go and clean boots for Sir William Graham Greene and he told of seeing Ben Greene step over the door into the convertible he drove as he was so tall. Bill/John Wright used to live next door to Walnut Cottage and work for the Hurrell’s. Now his son runs the lawnmower business at Shepreth. George Lacey (who worked for the railway) and Denis Chapman had a farm behind the Manse and ran cattle and pigs on the pastures behind and grew crops on a few bits of land. The Radfords, related to the Chapmans, also had land there and when High Meadow was built his house was knocked down and replaced with a new one further back into High Meadow. In Chapel Lane were Andraea’s nurseries where the bungalows now are. At the top was a little shop that sold sweets and cigarettes run by Andraea. To the right of Chapel Lane on the High St is the first house that the Willers built for Andraea, and later on they built a bungalow for him at 1 Chapel Lane after he had been persuaded to sell his land so the Chapel could be improved by extending it. After Andraea died Brian’s mother bought the bungalow from him and moved back to Harston. Brian and john Pidduck also helped to build the bungalows, mainly all the wood work, for Tony Gatward and his sister. Originally there were lots of sidings by the railway, where Tanner & Hall now are. There was also a signal box and platform. Tom Want used to slowly open the gates at the level crossing by hand. When the railway closed he went to work at the Mill.